Book now for Not Another Blockchain Seminar! We are pleased to announce our next MPA Specialist Seminar: (Not) Another Blockchain Seminar! 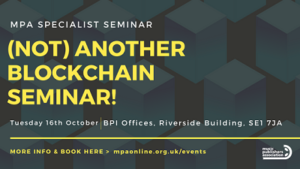 Taking place on Tuesday 16th October at the BPI Boardroom, Waterloo, the next MPA Specialist Seminar will delve into Blockchain, Cryptocurrencies, AI and VR, and will address the impact of technology on the future of the music publishing business. The popular Specialist Seminar series has been a staple in the MPA calendar for many years, covering a range of topics including Sync, Sub-Publishing, US Copyright, Digital and most recently How to Grow a Publishing Company. This time we’re throwing our hat into the tech ring as we look at how technological advancements have and will change music publishing. Our sessions will feature a line-up of top experts in their field, with speakers to be announced. You can view the full programme (including discussion topics) and book your place by clicking here.